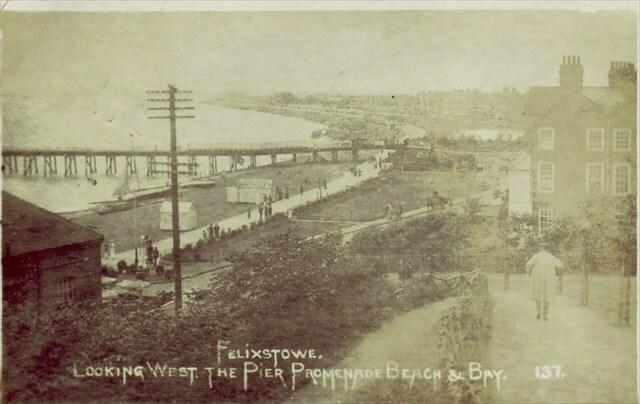 Felixstowe Pier was built in 1905, the last of a trio or piers constructed for the Coast Development Company in Suffolk. These three piers, the other two based at Southwold and Lowestoft, served the 'Belle' Steamer fleet, which endeavoured to provide profitable excursions at a time when local steamers faced fierce competition from the increasingly popular railways. Unusual for its time, Felixstowe Pier was created from timber, rather than iron. Developments in ship building had led to foreign timbers, like Jarrah and Greenheart, being used as constriction materials, owing to them being more resistant to worm attack and much cost effective. Once one of the longest piers in Britain, complete with electric tramway (3.5ft gauge) transporting passengers and their luggage from end to end. The original cost for a one-way journey was 1 pence. The pier was built for the Coast Development Company Ltd., which was formed in 1898 by a merger between Belle Steamers Ltd. and other local concerns. Promoted in 1903, the pier opened in August 1905 to a length of half a mile. It incorporated a 3 foot 6 inch gauge electric tramway. In 1905, the Coast Development Company was succeeded by the Coast Development Corporation Ltd. They went into liquidation in 1915 and were wound up in 1922. East Coast Piers Ltd., who continued the summer-only operation of the tramway, acquired both pier and tramway. The tramway service was suspended at the outbreak of World War II and never resumed. The pier was sectioned for defence reasons and its seaward end was demolished after the war.